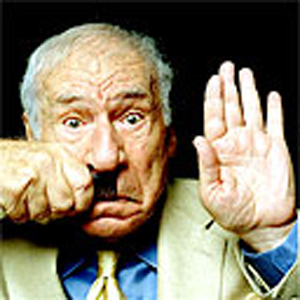 On December 10, 1975, the 13th and final episode of Mel Brooks' When Things Were Rotten aired on ABC. Hoping to do for the Middle Ages what Blazing Saddles did for the Old West, the absurdist comedy premiered in the top 20 but quickly tanked. A critical success, it couldn't survive in its Wednesday 8 pm time slot opposite Tony Orlando and Dawn on CBS and Little House on the Prairie on NBC. In that primitive age- before the Internet, before DVRs, yea, verily, even before Betamaxes- moms and dads opted for musical variety and wholesome viewing on the family's two television sets. It was a shame. In addition to Brooks, the series boasted top-name talent. The show's bouncy theme was written by Charles Strouse and Lee Adams, the guys who did Bye Bye Birdie, Applause, and Annie. Four episodes were directed by Peter Hunt, better known for directing the Tony-winning musical 1776 and its movie adaptation. Villain: "Are you ready to tell that to your maker?" Victim (to camera): "Mel! I didn't do it!" Then came Robin Hood... ba-bah! Except what they kept for expenses!